I have been working in the past week to schedule a presentation at a TEDx Conference. I think this forum would be really important to getting my message that youth can be the changemakers of tomorrow out there. 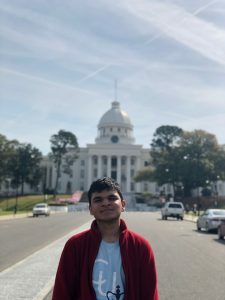 I really enjoy connecting with others through my experiences running a non-profit, which is why I run this blog! I think if I can give this presentation, I can really change the discourse surrounding youth from lazy or entitled to dormant activists who just need some support from society to revolutionize their society. I am also still working on creating my presentation for Intel’s International Science and Engineering Fair in Pheonix, AZ. I wanted to rework my current poster based on the wonderful feedback I got from judges at NYCSEF. However, this is a major project, and I worry that my focus on this may divert attention to more important functionings of this organization. Let me know what y’all think! Phase 1 of the new workshop push Health Disparity is embarking on occurred today. I hosted a workshop for students at my school about health disparities. This was really special because my friends at the Cancer Awareness Club joined me and spoke about their work raising funds for the American Cancer Society. The engagement from the audience was incredible! I fielded insightful questions from freshman to seniors, and I got to share some exciting new research about health disparities. 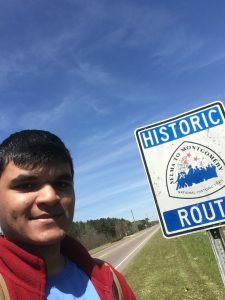 For example, one question about why minorities suffer from more deadly cancers led me to share the findings of my ISEF Finalist research about genetic health disparities in prostate cancer. I am proud to have been a peer leader to these students, and I certainly hope that my thesis that health education must start at an early age resonated. I am unlikely to forget all the students who approached me afterwards telling me how impactful the workshop was. It is this connection that makes my non-profit work meaningful and keeps me going! In the next 6-8 weeks, we will be having some major health disparities events! The best part is that these events are going to be instances where my team will surely shine as they will be leading them. First, I have an event during my school’s Book Day. This year, we are reading “Born a Crime” by Trevor Noah, and the health disparities club are partnering to host a workshop about health disparities in the US and South Africa. In just a few weeks will be our annual symposium, where we have a Representative for Governor Cuomo and a member of our board speaking to the student body about their work and the importance of health disparities awareness. Aside from that backbreaking schedule, there will be a series of 6-8 health fairs that several student volunteers from this organization will attend and present our data. I’m so excited for what’s coming up. In less than 5 minutes, I filed this non-profit’s taxes. To put that into context, I spent more time remembering and repeatedly failing to input my login details than filling out the “E-Postcard” that amounts to the form I have to file. i just wanted to share how incredible that was. I’m back home for the wee days that remain in my spring break. 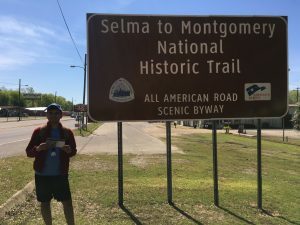 I have shared the blog posts (154-159) about my Selma to Montgomery journey with members of the Health Disparity network, and I am getting some really positive reception. 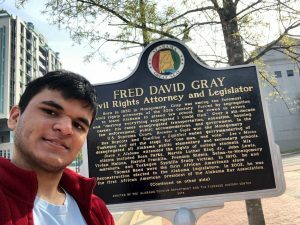 it’s so great to have support from adults for my journey, and I hope sharing this event with others has inspired some more reflection about Civil Rights and individual action. I had a thought I wanted to share with prospective youth non-profit founders. Find a home base. Find a recurring non-profit with a similar mission as your and start small with them. Have a recurring event there, set up a small office in the corner where you can work quietly. Whatever it is, having a location that you can always turn to when a new opportunity arises that requires a location and an established organization is always good. This is my last day in Alabama. 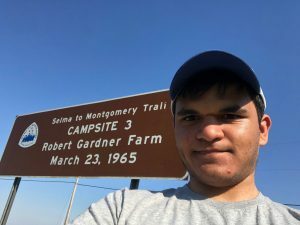 It has certainly been a heart-wrenching experience which has taken me to some of my lowest lows, but also some really exhilarating experiences as well. I’m going to miss this place, but I expect that it will never leave me. 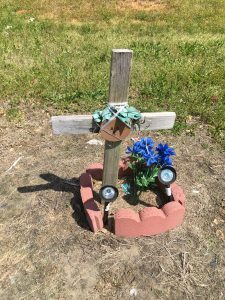 A memorial I saw on the side of a road. 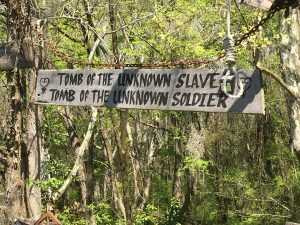 What surprised me was the “Tomb of the Unknown Slave”. It seems so… appropriate for a memorial, especially when considering how prolific Tomb of the Unknown Soldiers are. I’m surprised I have not seen any Tombs of the Unknown Slave before, but I hope to see more soon. 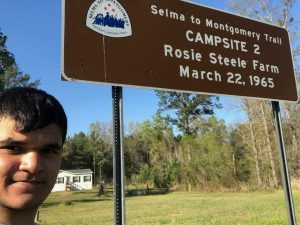 The Civil Rights Memorial Park near Selma. The wood in this gate dates back to use in the slave trade. 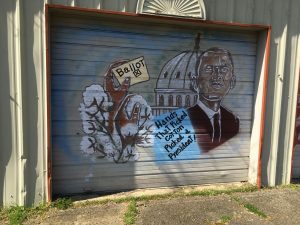 An awesome mural I saw on the side of a road celebrating Civil Rights leaders. 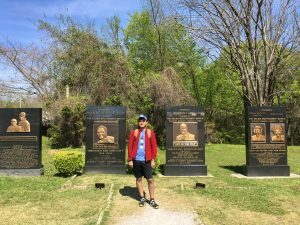 A cool memorial for Civil Rights heroes. Congressman Lewis has his own stone, which is rad! 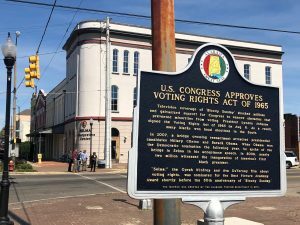 A flyer for the National Voting Rights Museum right along the 52 mile historical trail. 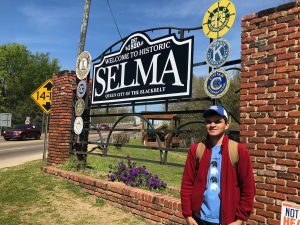 Today I continued exploring Montgomery and surrounding landmarks in Alabama to totally immerse myself in the Civil Rights story and the experiences of Dr. King and his marchers. 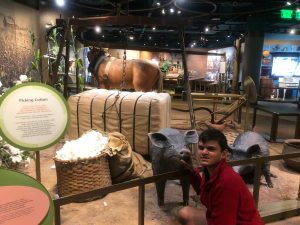 Alabama State Museum. I saw some chilling Confederate antiques. 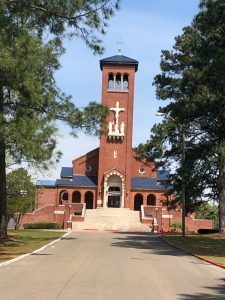 Tuskegee Alabama. 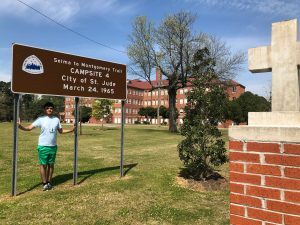 Here I visited the Legacy Museum to learn about the Tuskegee Syphilis Experiment which transpired 65 years ago. 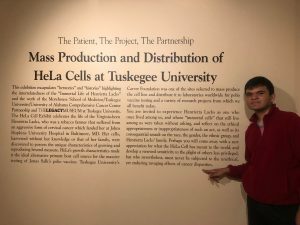 I also had a chance to learn about the much publicized HeLa cell line and the controversies surrounding its procurement from Henrietta Lacks. I saw some interesting artifacts from both of these incidents that have certainly given me pause. 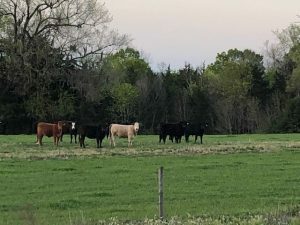 Alabama had so many cattle ranches! 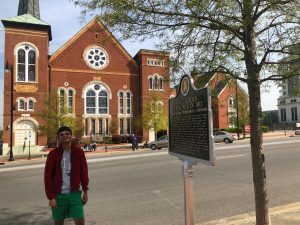 Today was about finishing my journey, visiting Montgomery and understanding the legacy of Civil Rights in this city. 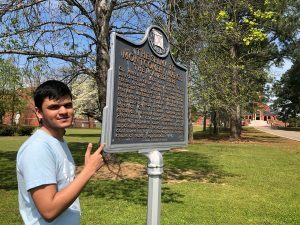 Today, I also went to Tuskegee Alabama to learn more about the Tuskegee Syphilis Experiment, an atrocity which still causes distrust of healthcare professionals to this day in communities of color. 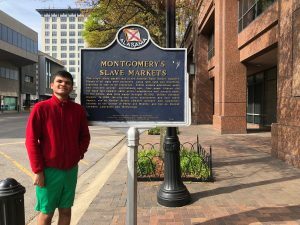 The legacy of slavery and segregation was still strong in Montgomery. 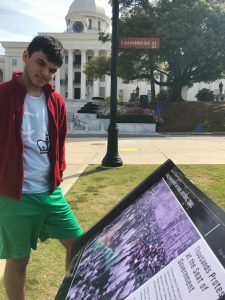 I was particularly surprised that a large Confederate monument remained standing next to the Alabama capital building and a statue of Jefferson Davis was placed in front of the building. Further, the Confederate White House was across the street from the State House. These disturbing structures were offset by the heartening sights I saw of Civil Rights monuments and museums. 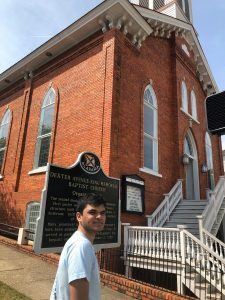 A few feet away from the largest slave auction in the South was the location where Rosa Parks began the Montgomery Bus Boycott, and a block down from the Confederate White House was the church at which Dr. Martin Luther King was a pastor. Finished the 52 miles! 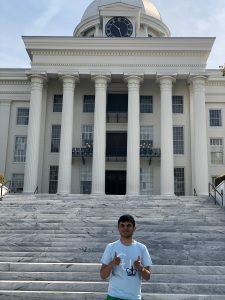 Montgomery state capital. 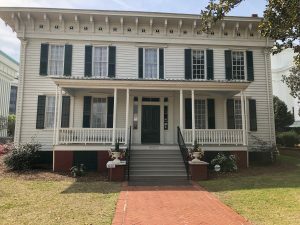 This is the First White House of the Confederacy. Interestingly, this is adjacent to the current State House and other official buildings. 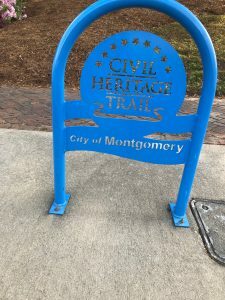 A cool bike rack/reminder of the history of Montgomery as a City. 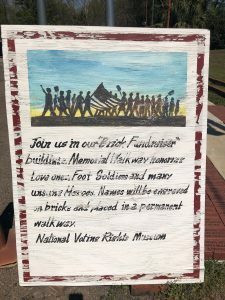 This was placed along the historic marchers’ route to the State House upon entering the City of Montgomery on the last leg of their journey. Wow. Walking is really hard. 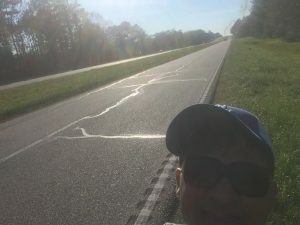 Walking for upwards of 11 hours in the cloudless Alabama sun on the side of a highway with cars screeching past is reallyyy hard. I walked from around 7:30 in the morning to dusk, 6 in the evening. On the side of the road were cattle, wild horses and dogs. My most enduring memory however was the emptiness and open fields I saw. For a city kid, the relative calm of the place is refreshing (aside from the blaring horns of cars passing by). In that sense, it was relaxing. 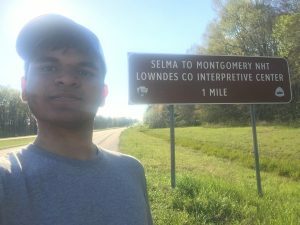 As I approached Montgomery, my legs increasingly felt like they were going to fall off, but I persisted and when I reached the state capital, I was so glad I made the trip. 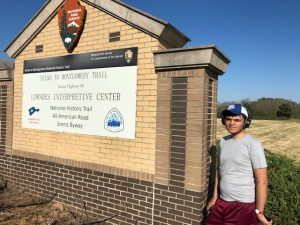 42 miles of walking and I became a different person. Saddest thing was getting dermatitis from walking for so long in the sun. 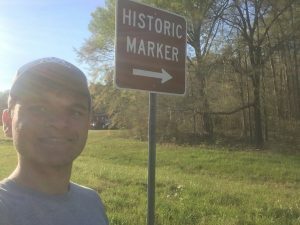 Something interesting I realized while visiting the various markers: I am marching within 2 or 3 days of when the event took place in 1965. I really am embodying a slice of history. 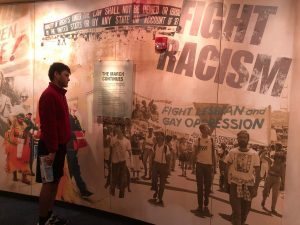 In advance of the second historic campsite, the National Parks Service has an Interpretative Center describing the story of this March. 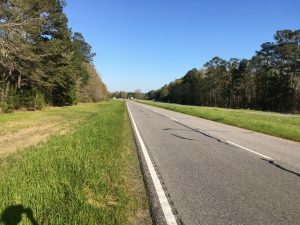 Some photos I took on the road. It’s 8 PM right now. I am still reeling from my day. It was an incredibly rewarding and emotionally powerful journey. 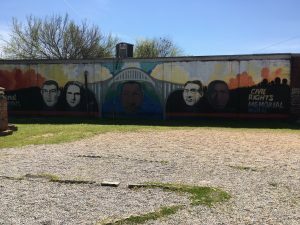 As I crossed the Edmund Pettus Bridge on my way to Montgomery on foot, I saw beautiful mural depicting Civil Rights heroes. 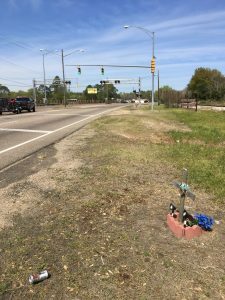 I saw roadside shrines to loved ones who perished during the Civil Rights movement. 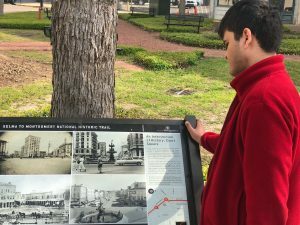 Residents shared with me their own stories of the fateful March in 1965, the kinsmen they lost in “Bloody Sunday” or the way their community had moved on since the South desegregated. I’m physically exhausted too. After more than 42,000 steps and 16 miles (according to my pedometer), I feel like I’ve done a week’s worth of exercise. 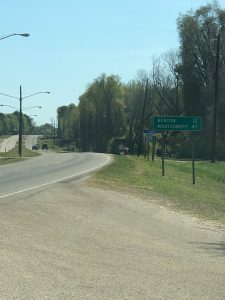 I Sweated under the hot Alabama sun while I dodged oncoming traffic and dashed from gas station to gas station to ensure I had enough supplies. 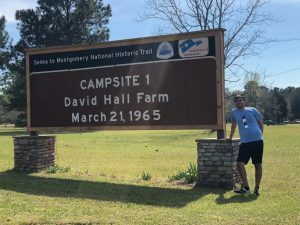 I also stopped at a Historic Campsite where the real marchers stopped on their way to Montgomery. I will continue to keep you posted on my journey. Until then, enjoy some multimedia! 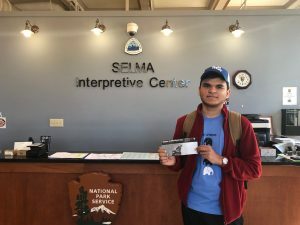 It all starts here, at the Selma Interpretative Center run by the National Parks Service. A film celebrating this march being advertised on the Historic Route. Incredible! 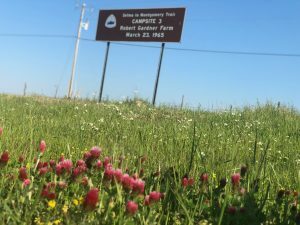 The site of the first of 4 campsite the historic marchers used. Otherwise, this city was certainly a different experience than what I see in NY. Certainly a very “Southern” feel. I will begin walking in a few hours. Today, I interviewed for a support grant for the Health Disparities Club that I run at my school. It was such a… profound experience. I had a group of my peers who join me on the leadership team in the conference room as well, and I felt like there was a type of magic between us as we were able to hand off the baton and answer the question that pertained most closely to our portion of the proposal. The interviewers were surprising actually. Rather than grill us (which I expected them to do), they were really enthusiastic about our mission and even gave us new ideas to improve it in the future. They understood at a very deep level how meaningful health disparities activism was to us and the community at large, and we were able to have really productive conversations about how to move forward if awarded a grant. The sky is looking a little brighter today. I would like to share a paper that I co-authored and was just got published. The title is “Neighborhood Social Environment and Cardiovascular Disease Risk” in Current Cardiovascular Risk Reports. Here is the link. It’s been such an incredible experience overall, hope to do some more soon! Also, I did an SAT today. Wow am I tired. Executive decision to cut this post short. See you next week. I didn’t sit down and write one of these out this weekend (NYCSEF went loooong), so I’m thanking my lucky stars I had a snow day today! It turns out that bringing in new members to the non-profit is hard. 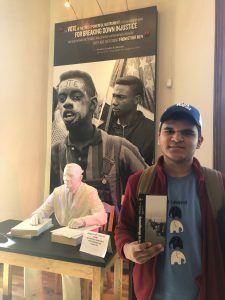 Just today, I spoke with a student who had attended one of our workshops, and had initially expressed interest in becoming a young activist himself. We spoke about a lot of issues: how he saw healthcare, what he thought should be done to improve health and wellness for minorities, why health disparities persist, his interest in helping others and where he saw himself in the future. I thought he was enthusiastic, fun and knowledgeable, and the whole interview was going swell. When I began discussing the time commitment and potential projects though, we realized that we would be incompatible. It takes a lot to be an activist. Not just in terms of time and effort, but in emotional labor. In being a shoulder for others to lean on and a listening ear for those in need. This is something no one ever tells you about activism, but it’s something I endeavor to tell all of the volunteers who have joined this non-profit. I believe we are stronger for it. Wow. 150 posts. That’s crazy. Just a few months ago I thought that it would be wild if we reached 125 or 130 posts. I was just recently looking back at all the insights that I’ve gained through this blog and I see clearly the value it has had on my development as a student and leader, and am so glad that I started it and have had the opportunity to interact with other other readers here. Here’s to 150 more posts! I wanted to briefly discuss an initiative that I’ve been working on for the last few weeks. I have been building up team Health Disparity, culminating in the recruitment of a few new members on board. I’m a little bit worried that this team building and leadership won’t facilitate new workshops. I consider recruitment as an investment in the future. There is a real chance it doesn’t pay off and our activities may suffer for it. But my fingers are crossed, and I’m optimistic. A lot of folks would chuckle if told that one could have too many opportunities. After all, high schoolers these dies are practically fighting to be able to have another opportunity to lead this or receive an award in that. For a non-profit though, opportunities are hidden poisons. Each new event can lead you down 2 or 3 new tracks of outreach, from a book tour to crafting legislation to travelling to another country. Worse, it’s incredibly hard to turn down opportunities once you see the arm outstretched. Like a siren’s call, you are transfixed and follow it to wherever it leads. That’s why I practice reason and moderation in every activity the non-profit does, learning form the lessons of my 9th grade self. Another post this week, because I need it. Since I began reaching out to my old contacts, I have found it be like a knife going through butter. They reply within days, rather than the weeks I am used to during cold calls. They are so warm, and it’s like I never stopped talking to them. They have lots of ideas about new events and workshops, including a full series in summer for some of our newer volunteers. Anyway, I just wanted to let you know how warm it feels knowing that these contacts are so strong, lifetime potential? The health disparities club annual symposium is rapidly approaching. I’ll be honest, I’m a little more nervous for our second one than our first. We have a US congressman coming, which is insane! Do we need special chairs, bottled Evian water? How does one ensure that a US congressman is being taken care of? Also, I have much less prep time than normal. This symposium will take place in March, and seeing as it is February already and I still don’t have a date set, I will have to scramble closer to the event. At least the whole club team is staying strong. We are discussing regularly the event, and the advisor also is giving us input. The title of this post is a humorous take on a subject line which I have been increasingly using this week. I’ve been reaching out to some old contacts (and I mean old) to schedule some events for some of the new members of our team. It’s surprisingly hard to reconnect with old contacts. I have to remember where we left things, what projects we work on and how I may look coming to them after so many months or years asking to re-partner. However, one thing I have learned from non-profit management is that a good contact made is worth 1000 business cards. I treasure the relationships I have built with local community leaders, and see them as an important asset in assisting Health Disparity in raising awareness amongst youth. It has been quite difficult lately managing my team of student volunteers. With school in full swing, neither the motivation nor the energy seems to come easily for students, and I worry that our workshop schedule will suffer. Providing contacts and useful links isn’t as motivating or helpful as I would have hoped. Do any of you folks have ideas on what to do? It’s MLK weekend and its a time to reflect and thoughtfully consider the influence of this great man on our nation. 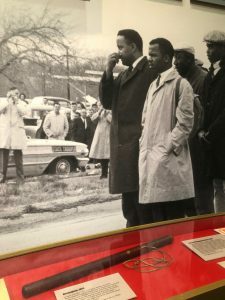 Whenever I connect with students of color, they mention how much of an inspiration his story is to them. 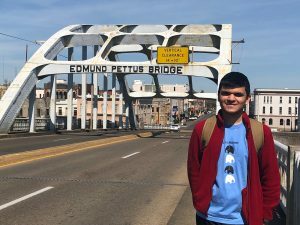 There is this story that one student told me that still sticks with me: their father marched with MLK in the south, and he saw that the Civil Rights Movement was as much about making the nation aware of the injustices as actually fixing them. 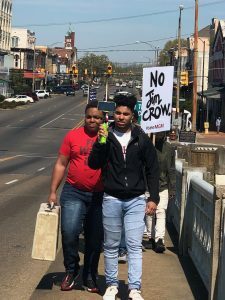 Essentially, MLK believed that if people knew about how black folk were being treated in the South, they would take action. This idea stuck with me because it is sort of like what I do with my non-profit. Making folks aware is half the battle! So I just got home from Ohio. First things first: we were awarded $1000 dollars from the Accelerator. That’s absolutely crazy. I’m so proud of Team Health Disparity in Ohio, we really crushed it. Let me give you a recap of what happened. Once I touched down after the last blog, I went to my hotel where I had the best grilled cheese sandwiches I have ever eaten. I also got to meet some of the other students who were part of the program. We talked about how each of us found out about the Accelerator, and what it felt like to be a part of it. We also talked really honestly about our non-profits, and the ups and the downs and the periods where it feels like there is so much responsibility you can hardly breathe and the periods you’re bored out of your mind and the periods you”re smiling so much it hurts. The following day, we got to attend seminars about how to manage a non-profit and how to build on our progress. The organizers invited so many advisers, from business consultants to hospital administrators, to even some football players! They all had something interesting to say about Health Disparity, and my Notes app on my phone is brimming with their comments. I also got feedback from all of the attendees about Team Health Disparity’s Pitch. I feel like a VIP. i’m flying in an all-expenses paid plane and am about to be driven by a black car to a pre-paid hotel room. This plane isn’t even half bad! Never mind the fact that all I can think about is how the judges will think of me and if my mentors at the program will think my non-profit has a strong foundation. I will be in the Pro Football Hall of Fame for the pitch, where I will be able to meet some football players. That will certainly be a cool experience (I’m a patriots fan myself). I’m also editing our slideshow on Google Slides and because our plane doesn’t have wifi, I have to pair my computer with my iphone. At least I can communicate with all of you guys from 30,000 feet in the air. I just wanted to do a quick update about the website. Updating it is a fascinating experience for me, especially when i was just beginning. I had no experience in web development, and so I had to learn a lot very quickly about Boldgrid, WordPress, Ninjaforms and a bunch of other compound words. Since the early days, I have found it to be almost meditative to update this site. It’s like an organically growing resume with color photos and captions. Whenever an event is over, one of the first things I do when I get home is upload photos to this site because I’m so excited to share my work. I promised this in a previous blog so here goes. My midterm prediction is the Democrats take the house (I mean, 75% on FiveThirtyEight, no brainer!) and 50/50 in Senate. I’m feeling good about incumbents in red states for Democrats, and I think Dean Heller will fall in Nevada. Tennessee looks like it will stay Red, and North Dakota is increasingly looking Red. Arizona is anyone’s guess. And, oh yeah, governors. I think they will all align based on how the state voted in 2016, except for Florida (Gillum has massive leads), Kansas (Brownback is leaving a bad legacy) and all of the various New England Republican governors. Oh, and I almost forgot, Beto will win. All joking aside, for the Ohio Accelerator which I have discussed before on this blog, my team has to form a pitch about our work and wow, is it hard. I have to create Powerpoints for things like the curriculums I integrate into hospital high school internships, health classes and workshops, but this is a much different experience. Guidelines say it has to be readable, understandable, short, informative, interesting and visually engaging, which feels like a tall order to me! After an absolutely whirlwind event schedule, i had a chance to reflect on my experiences and discuss with my team what I learned. One thing I learned and shared was how many young people were already out there taking action. Especially heartening was the volume of student of color activists I saw during the past few events. This is key to my non-profit’s progression as there is a large network of activists just in my hometown who we should be partnering with, or at least having coffee with! 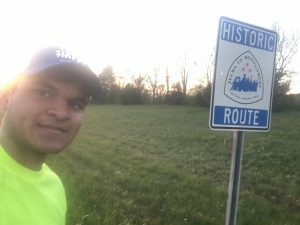 Post 136: Back to Back Events! Woah! Another event so soon! That’s right, I was part of a youth leadership panel at the Carnegie Corporation of New York. There, I spoke about my non-profit’s story and how young people can be activated to improve their community’s health. 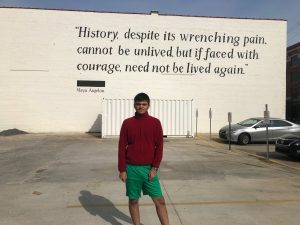 I got to meet 4 other students who were improving their communities, from a Yale undergraduate who helped refugees to a student in Harlem hosting community town halls. The folks at the Corporation were so great! I loved to talk to them about how and why they support young people and made some valuable connections. Recently, I did some events that I think were pretty cool. First, I was invited to a book tour of an author who writes about the stories of young change makers and their experiences: Eric Dawson. I got to shake hands with attendees, give a keynote lecture and read and listen to the inspirational stories of other young leaders. I was surprisingly nervous to do this event because I had never done a book tour, but I found the experience to be really enriching. I got to exchange notes with the author about his book, and networked with a few attendees who I thought were really cool. The whole experience was a blast, and I hope to do more soon! As many of you know, my team is reaching out to schools and community centers and is hosting workshops across the tri-state area. Recently, one team member approached me and asked what traits he should be exhibiting when he gives a presentation. I sat with him and told him about the importance of being earnest and how students respond best to honest conversation. I reminded him that it was the teachers who were most frank with him that engaged him most. He really internalized that idea, and I am looking forward to his workshop! I’ve recently begun to read Malcolm Gladwell’s “David and Goliath”, and I am thinking of the story of Br’er Rabbit. Essentially, this fictional tale describes how someone supposedly disadvantaged can actually have a hidden advantage over their adversary. 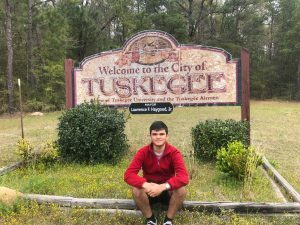 In many ways, students across America are the quintessential Br’er Rabbits. They have so much talent that adults often miss. I also think of myself and the many ways I have advantages and disadvantages I don’t even think about. Yeah. I went to Staples today. No biggie. I was on the verge of tears in my room because of the school year. Also no biggie. And did I mention it’s the start of the dreaded, the hated, the feared 11th grade. I’m nervous, but a little excited. Maybe this year, I’ll learn something new about myself (or more likely push myself to a limit I didn’t know was humanly possible). I can’t even bring myself to write more. No. This is not my academic midterms. Not yet at least! As all of you readers know, the US will about to be convulsed with midterms excitement. The midterms are a chance for political analysts to dust off their prediction models and their big screen tv’s. I love politics, so every day I fervently check FiveThirtyEight, McClatchy and other political websites hoping to learn the latest bombshell report. When we get closer to voting (or even when early vote totals start coming back), I’ll share some more thought! On another note: I wanted to share some insight I had. I have been reaching out to various US House, Senate, and my state and local representatives to invite some to speak at my club’s annual health disparities symposium. I found out that after all of this reaching out for an event in January, no one has calendars that go that far! That’s right, every politician’s calendar is dictated by the election, and as the midterms are coming, no one really knows what their schedule will look like afterwards. Pretty weird right? Wow. So a few days ago I shot the video with Peacefirst I had mentioned earlier in the blog. It was such an incredible experience! First, some background: Peacefirst invited 5 youth activists from across the country to share their stories and inspire others in a professionally shot video. With the help of a camera team, we filmed this video in various locations around Flatbush, Brooklyn- the community where I first got inspired to work to achieve health equity in 2016. A student volunteer and a board member came to the shoot and participated in some B-roll production, which I am also thankful for. All in all, a tiring but exciting day. Would totally do it again! As a few of you know, for the past year we have had a P.O box for Health Disparity. There is a tough decision facing the team this week: whether or not to renew. We have to pay a set fee per year we have the P.O box, but the use has been limited. We expected to have lots of correspondence be shared to it, but E-mails and calls have made up the vast majority of communication. I guess we should have seen this coming, I mean why would a non-profit be receiving very many letters? We only really use it on tax forms and other legal documents, the only correspondence which clings to snail mail. Let us know your recommendations. The end of the summer is approaching, eek! I’m worried I won’t be able to do much work with the non-profit in the coming weeks and months. 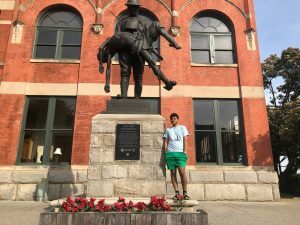 As I enter junior year, the spectre of standardized testing is looming large, and I see the open days on my calendar when i would be going into the community dry up. I’ve been communicating closely with my team about this challenge, and they are supportive. Some have even volunteered to do a little more management work for the non-profit to make the Fall a little easier for me. I’m proud in the character of the team as they are resilient and kind in picking up and helping out others. I’m back home in New York today. I’m planning on doing some more workshops and health fairs while I’m here. I’m really proud of all the research I conducted at the NIH, and I really learned a lot about the challenge of health disparities; I’ll be making some addition to the Powerpoints in the coming days! Now that I’m home, I’ve been indulging in my hobby of running a lot. I have a plan to run a half marathon in a few months. The Health Disparity team is doing great. A few will be joining me for the video we will be filming later this month with Peacefirst. I’m especially excited Diane Nathaniel, a cancer survivor and Health Disparity board member, will be joining us. Here are a few notes from some brainstorming I was doing on the train this morning. Don’t be afraid to ask for help. Community leaders and other activists will be important contacts to make early on in your work. They can help refine and improve your message, and connect you with others doing similar work. Dream big! Just because you are young doesn’t mean you can’t make an outsize impact in your community. Believe in yourself and your message. I’m getting a little choked up writing this. In a few days, I’ll be leaving the NIH for the summer. I have had such an incredible time here, made some good friends and learned so much I feel like a different person than in June. 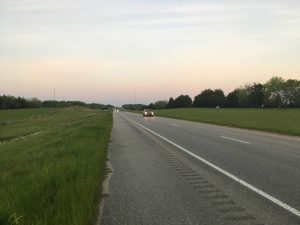 My experience living in a different state for 8 weeks has been a whirlwind. I was immersed in all of the challenges of essentially living by yourself! However, the experience made any challenging moments worth it, and I will miss this place in New York. Maybe I’ll come back soon though. I have been hard at work on this editorial for the past few months and I have developed some insights that I think are worth sharing. The primary one is the crux of the piece: that investors on Wall Street can serve as a model for how best we should conduct health disparities activism in the community. The general idea is that “activist investors” are motivated and are not afraid to challenge authority and create popular support around their ideas, usually concerning the management of a business. If we local activists study their methods of influencing large institutions, then we too can radically change the formidable institution of healthcare through individual action. I think this is an interesting idea, so please let me know what y’all think of it. I was delighted today to find out that Peacefirst had asked the story and team members of the non-profit be filmed and shared for a video they are preparing on the five most important young peacemakers in the United States. We plan to do this filming in Flatbush, Brooklyn, where the idea for the non-profit was first born. I am currently reaching out to other team members, as well as our board, to gauge interest in this project. It would be a great chance for all the various members to meet physically and share our stories. The faith based community is receptive to calls for health equity. 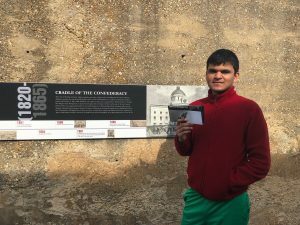 In both New York City and D.C, the faith community is taking leadership in this fight as most health fairs and events happen in their buildings and flyers and other recruitment materials are distributed there. One of my PI’s here at the NIH is developing an interesting app for minority communities that I thought would be interesting to share. It gives minority participants clear nutrition and exercise goals that are personalized to alleviate health problems that participants are predisposed to. For example, the app recommends lower alcohol intake and less red meat consumption for those with liver problems. It also has weekly check ins and calculates BMI. 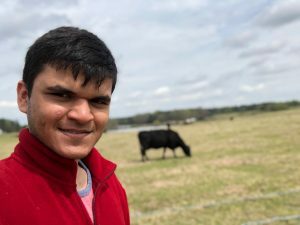 I found this idea to be really interesting as in my experience, minority communities respond well to technology that is personalized to their needs. I will see if this app can be integrated into our workshops in any way as a supplement. There is a tab on the website that centers on the clinical and epidemiological health disparities research that I work on. At the NIH in the past few weeks, I have learned some new analytical tools I can use to help me better analyze population health data. One good tool is ISearch, which was developed by the NIH specifically for researchers there. This tool allows me to look at all scientific publications internationally, including those not approved by journals. I can also see pharmaceutical records, accepted and rejected NIH grant applications and so much more. Now, whenever I need to do a literature review, I will have so much more statistical power at my fingertips. Post 115: The Event is here! The UMB CURE Scholars event is catching up. It’ll happen by the next blog post. I’ve been scrambling to arrange the schedule and get everything set up perfectly. I’ve also been talking with a few of my school club members (Health Disparities Club), and planning out our annual Health Disparities Symposium. We had a really successful event last year, and so we are hoping to do even better this year by starting planning early. Hopefully we can confirm some speakers over the summer so that when school starts, we will have an easier time compared to last year in the days and weeks leading up to the big event. Rather than talk about the non-profit, I want to actually talk about how I’ve been, personally, at Maryland. Remember how nervous I was about making friends and enjoying my time here? Yeah, on the first day all those worries were dispelled. even though most of my new friends are older than me, the program does good job of connecting interns with common interests and hosting events for bonding, like popsicle hours. This July 4th (tonight), I’ll be heading out with a few of them to enjoy the fireworks and eat at a restaurant. Sorry for the late post, I’ve been bogged down with assignments at the NIH. I’ve been corresponding and talking a lot with the student who will be giving the workshop at the CURE Scholars Program with me, and we’ve been setting up some more protocols for survey distribution and focus group collections and analysis. This’ll be the first place we will have done a focus group, so I’ve been trying to make sure that we both are on the same page and are confident that we can run it smoothly and accurately. I know. Very exciting. So I’ve gotten started on the projects I’ll be working on here at the NIH, and I want to share those with you. Remember how a few blog posts ago I was doing a personal literature review on health disparities? Well, it turns out that I am doing a professional one to look at the state of the field going back decades and looking at multiple social variables ranging from built environment, immigration status and insurance coverage. Hopefully I will learn something to make me a more effective liaison of information about health disparities during student workshops. I have also been on the ground in D.C for NIH community outreach research trips, and I have found a community which struggles with a lot of similar health and trust related problems which threaten minority communities in New York City. It was eye opening to see the parallels, proving that this challenge is truly nationwide. Peacefirst, an organization which helps young non-profits develop and which awarded us a $200 mini grant in February, has invited us to apply for a youth Healthcare non-profit All-Expenses Paid Accelerator in Ohio this Veteran’s Day weekend. When I heard about the program, I was impressed. We could get mentorship, additional funds to support workshops and bond as a team. However, I’m worried about how competitive of a selection process they must have. This would be such an important program to be a part of, as I prepare the application in the next few days, I’m crossing my finger. 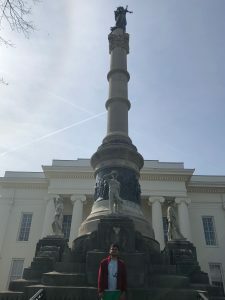 I’ve heard from all of the team members, and one was available to take the drive down to Baltimore to give the workshop with me at the University. I’m really looking forward to it on July 10th. Tomorrow, I will be dropped off at the NIH. I’m so nervous and excited about this internship. On the one hand, most of the other interns are undergraduate and graduate students, and I’m worried I’ll have trouble making friends. I’ll also be away from home in Maryland for 8 weeks, which is daunting. On the other hand, I am looking forward to see what the cutting edge of health disparities research looks like, as well as seeing how the NIH functions. I’ll keep you posted about my experiences. In my last post, I mentioned how minority racial groups are suffering increased mortality rates. To pick up on that topic, I have found that this trend of a lowering of American life expectancy has only ever happened consecutively in the 1960’s That’s right, for the past nearly 60 years, 2 year life expectancy has been going up, except these past two years according to the CDC. I’ve been so disturbed by this statistic that I’ve begun to write an editorial with some more evidence about the detrimental effects of health disparities in the country, as well as some advice for readers on how they can take action right now to improve their family’s and community’s health through conversation and trust building with healthcare facilities. I will share this article with you in the coming months as it gets published. I was helping a team member today reach out to organizations and local non-profits so that they can host their first workshop. I had not done so myself in a long while, so I have actually forgotten how difficult it is to write to dozens of email addresses (many of them no longer working), hoping that 5% reply. It is a really stressful process, and I was sure to help the team member stay positive and motivated throughout the call. In my experience, reaching out to contacts makes for an easier time in setting up events, so I shared a few of those as well with the team. Today I got an email from some faculty at the UMB CURE Scholars program. 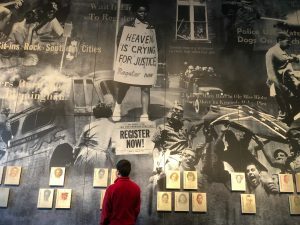 For new visitors of the blog, we have partnered with this program this year to help create modules to educate their students about health disparities. In this email, the have invited us to present a workshop to their students. I was super excited to read the email, and I of course agreed to present. I also reached out to the entire team of student volunteers to see if any of them would like to join me. I’ll let you know soon what they say. Mmmm. School’s out. I woke up late this morning. It was nice. I guess now’s a good time to tell you about an internship I’ll be doing this summer at the National Institutes of Health. As part of the SIP Program, I will be at the National Heart, Lung and Blood Institute helping health disparities researchers investigate various aspects of social determinants of disease, and I will also be on the ground in Washington D.C doing research on NIH Programs that are working to alleviate disparities in that community. I will definitely be keeping an eye out to see if they are implementing any novel methods of informing the community about racial disease predisposition for workshops. I’m super excited to get started in a few weeks! So it’s been a few hours since I gave the team a group call for the first time… it was pretty exciting. To be clear, I’ve spoken with all of them several times individually and in small groups, but never as a whole team. First of all, they all filled me in on what they had learned about health disparities in their time researching the topic. It was great to hear that they were all so interested in the issue, and inspired to work to alleviate it. After I told them what I had in mind for the summer agenda, they had some interesting additions to add, and almost everyone volunteered to take on even more responsibility in the non-profit. It sure is great to see so much interest in our mission! 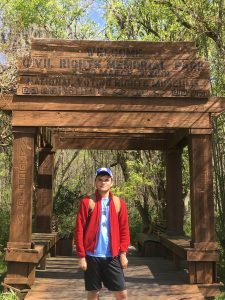 Post 101: School’s almost out, now what?? As the title says, school is almost out. That means that I have begun to reorient myself toward the non-profit once more. I have begun researching some more mentorship and support programs that we can reach out to in the coming weeks. I have also been writing to our network and checking in to see if there are any projects which we can participate in in the summer. Our first group call (with the entire student volunteer team) is scheduled for May 30th, so I will update you all then about how it goes. WE DID IT. THE BIG 100. We started this blog in August, and I’m proud to have finally hit 100 posts on this blog. Some metrics: 13, 038 word word count. 138 Gridblocks. 171 drafts. I’m nearing the end of testing, so I won’t be able to give a nice, formal update about our progress. I’ll just mention that the student volunteers have mostly finished their school as well and have been studying health disparities information for the past few days. I was talking to one of the non-profit’s team members from New Jersey today, and they mentioned this phrase. It’s from a Robert Frost poem, and I’ve been thinking about it a lot. It really does tie in to a primary message of the non-profit: community cohesion through health conversations. Any racial, socio-economic, geographic etc barriers to meaningful relationships between students can be surmounted with honest conversations about health. Maybe as Health DIsparity tears down these fences, students become less like good neighbors and more like better friends. As I begin to wrap up for the academic year, I’ve begun to reflect on how much progress we’ve made in 9 months. I’ve had to clean my room 🙁 and I have taken a look at some of the non-profit’s fact sheets and correspondence from last summer and even into 2016. WOW have we changed and adapted. Let me be clear, I’m excited about this change. We have learned a lot about how best to approach our mission and engage with students. I just wanted to quickly chime in in the middle of final trimester testing to fill you in on some thoughts. Cheers! I have talked in the past few posts about teamwork. I have been hard at work forming a team of students who have excitedly reached out to me, interested in the work that we do. I wanted to comment now about how surprisingly hard it is to be a team leader. Not only do I have to manage the operations of the non-profit, but the responsibilities of a team leader include mentorship of volunteers as well. Honestly, I’m a little nervous about this position, especially at the start of a daunting summer agenda, but I’m also a little eager to get started and see how things work out. I’ll keep you posted about my progress. Wow guys! I have gotten a lot of positive feedback from my previous post. it’s great to see not only engagement with the audience, but also how many of you do activism as well. You had some wonderful additions to the response I posted on Peacefirst, and I will definitely keep all of those in mind in the future. One particularly nice one I wanted to share was about framing the problem through your mind: what would make you care about the problem more? Anyway, hope that helps. Feel free to continue to reach out to me. I have certainly had this concern before, as I think every youth activist does. It’s a very challenging position to be in, but I would encourage them to find some resources online which can break down statistics into simpler terms, perhaps even integrating a story. We start all of our workshops with a story comparing health outcomes of two racially diverse women diagnosed with breast cancer, and we have found that this story effectively conveys the fatal consequences of health disparities as well as specific reasons, be they genetic, cultural or economical, for why disparities persist. Perhaps a similar story can be researched comparing students who live in areas with different gun safety laws. Hope this helps! For our new volunteers, I believe that we provide them with the resources and skills to develop a voice. Nearly all of our volunteers have not participated in youth activism before, and so many cultivate a voice through hosting workshops; they can become a peer leader or mentor figure for the students of color which we serve, and thus they learn the value of individual action in the health disparities fight. The effect of these workshops is to improve the health practices in communities of color, and so influencing behavior is a major part of the non-profit’s mission. For me, it was an incredibly exciting experience giving other passionate students the guidance and tools necessary to make a difference in their community. Whenever we have conference calls, our volunteers often excitedly tell me about an interesting health disparities research article they read or their feedback on how to improve our workshops, and I am proud that they have so personally taken on our mission. I have Peacefirst to thank for making this expansion possible as they helped support our 501(c)3 application and provided us seed resources to bring volunteers onboard. I’m really looking forward to continuing this expansion with Peacefirst! Many of our volunteers are from our school health disparities club, which I founded in 2016. We quickly got more than a dozen members and, with all of our members participating, we created our school’s first regular health disparities symposium during Unity Week and just a few weeks ago integrated health disparities into our health curriculum. These projects were created and primarily driven by my peers who gained a passion in the field of health disparities. Many of them have leadership positions in the club for next year and will manage several projects and expand our reach throughout the Bronx. 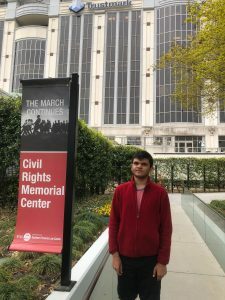 With the help of local organizations like Brooklyn Health Disparities Center, several students who wanted to make a difference in healthcare equity were encouraged to reach out to our non-profit. This summer, they will be organizing workshops throughout the New York metro area. They will collaborate with students at several of our medical center partners to help them display health disparities research in their schools. I am also training them in various statistical methods for analyzing health disparities using a national database run by the Centers for Disease Control. With the help of Peacefirst’s grant earlier this year, our 501(c)3 has been able to kickstart a new initiative which makes our mission self-sustaining. Students who participate in our workshops and express interest in alleviating health disparities are given mentoring and materials to host workshops in their own communities, fostering bonds and connections between peers. Our team has grown to nearly a dozen students! Through our peer-to-peer workshops, our student leaders ask questions like, “has anyone declined to see a healthcare professional despite having disease symptoms?” or “do your families trust their doctors?” Our volunteers have found that many students, especially those of minority backgrounds, say they are afraid to seek treatment because they fear losing hair as, for example, their aunt did after receiving treatment for breast cancer. Other forum attendees are suspicious of pharmaceutical companies’ motives in seeking African-American research volunteers. For the last two years as we have conducted these workshops, we have learned from our experiences and continue to reshape them: our student volunteer leaders have added information on food choices as the students most often inquire about how to eat healthily. We have also evolved to be culturally sensitive and friendly in directing them towards helpful resources as we have seen students be more receptive to sincere conversation. We envision health disparities to be an integral part of all New York City school curriculums as early health education makes for stronger and healthier communities. We would like to expand our student volunteer team and encourage students who are interested in health disparities activism to join the non-profit. 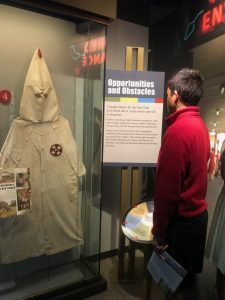 We have worked closely with several medical centers in the past few years, and have partnered with many to integrate health disparities into their high school internship curriculums. We would like to expand this effort and have a larger footprint in not only the tri-state area, but in medical centers across the country. One of our goals is to inspire more minority students to become healthcare professionals to serve their communities and regain confidence between patients and doctors. Hopefully, as researchers themselves, they will further investigate the health disparities challenge. 2. Consider collaborations. Try to connect with adults in the same field, be they community leaders, teachers, other non-profit founders, and see how you can partner with them to make your vision a reality. 3. Try to have conversations with the group you are trying to serve about how your project can make a difference. They can often see facets of the problem that are not visible to outside observers. For me, my conversations with minority students and healthcare professionals gave me valuable insights into the health disparities challenge and helped develop my model. Communities of color often are not aware of the existence of health disparities. 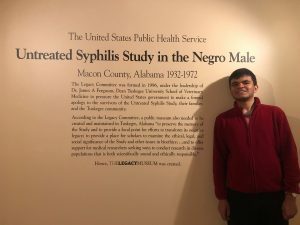 Instead, atrocities like the Tuskegee Syphilis Experiment are widely shared, which encourages cultural barriers for students and community members alike in putting trust in their healthcare professionals. Therefore, in nearly every workshop session, we are clear to demonstrate how the medical community has progressed, most notably with Institutional Review Boards, and why early treatment is important. We also stress that if communities of color are active participants in reforming medical environments, we can all ensure that abuse of power like the Tuskegee Syphilis Experiment never happen again. Another important challenge is the lack of awareness in the healthcare community about health disparities. Health disparities has only entered the mainstream for medical professionals in the past few years, so many researchers still hold misconceptions about the topic. This is why the non-profit has partnered with multiple medical centers across the Eastern Seaboard to make data-driven health disparities education a foundational plank in the education of the healthcare professionals of the future. We have worked to change their internship curriculums for middle and high school students. Further, during exposition days at these programs physicians have the opportunity to be exposed to health disparities research and understand the issue. We make health disparities awareness for students and medical professionals alike a priority on each and every one of these program partnerships. 1. Students learn about health disparities best when in a group environment and do not feel that the presenter is talking down or obfuscating the truth. 2. Students often do not feel that their health is their responsibility, but rather the responsibility of their parents, teachers etc. 3. There are few opportunities for students in communities of color to talk about health related issues in a safe space. 4. Students do have a desire to live healthy lives, but are often without guidance on how to do so. 5. Students appreciate having presenters who are students just like them. Today is my birthday! Wow, I’m 16 now. Soon my “youth-led non-profit” will just be a “non-profit”! Also, please have a look at Medline Plus’ report on health disparities here; https://medlineplus.gov/healthdisparities.html/. They have some important facts about the topic which are worth checking out. I have a few insights into teamwork I think are interesting to share. Being a leader of a team largely composed of my peers who lead workshops in their communities about health disparities has been an… insightful experience for me. I’ve actually learned how to better run workshops myself by seeing the successes of my peers. For example. beginning each question session with an open-ended question prompts students to think more deeply about the topic going into this session and thus ask more questions. I just wanted to update y’all on an event we will be attending on the 28th. Our partners at the University of Maryland, Baltimore, who have a program for middle school students called CURE have an expo. Health Disparity has teamed up with this program for the last few months, and we’ve really enjoyed our time mentoring and teaching the students about health disparities. We even helped the students create a video for distribution to friends and family about health disparities. I’m glad to say we have been invited to meet the students at the expo and see their research. I’m super excited to make the trip to Baltimore. I’ll give you an update soon about how it goes. Nearly every non-profit struggles with fundraising. After all, it’s an inherently difficult task that cuts against much of the community-focused energy of the non-profit. Through my work, I’ve spoken to many fundraisers for various NYC health disparities non-profits, and I wanted to share some insights about their advice with you. Have an idea of an ROI. Although donors are not looking for a monetary return, they like to see their support have a real impact on communities in need. Therefore you should be able to demonstrate how you have actually changed the Quality of Life for those you are trying to serve. Just like muscles recruit other muscles to participate in lifting when the load is too much, so too am I recruiting other students for my non-profit because the load is too much. I have asked a few students from my club to join the non-profit in an official capacity and sit-in/administer a few workshops. I plan to have our group learning sessions in a few weeks where all of the new team members can meet one another and immerse themselves in the topic of health disparities. I’m a little stressed, I’ll be honest, about asking my peers if they are interested. Wish me luck! Today, I had a wonderful health disparities experience at school. In class, we were learning about the Tuskegee Syphilis Experiments, and I mentioned how much of the distrust in minority communities towards healthcare professionals stems from this tragedy. 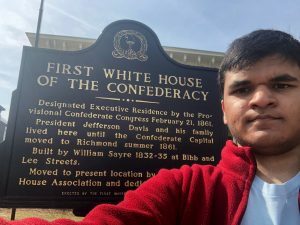 Another students chimes in that they had never heard of these Experiments, and didn’t understand why minorities might still feel scared of healthcare because of them. During that class, I had the chance to share the experience of students of color to a new audience. I was so incredibly happy when the students realized the scope of this tragedy and thanked me for shedding some light on it. First of all. No, I won’t be doing an April Fools day post today. Maybe next year! I try to stay up to date on all the important health disparities research that comes out. In this pursuit, i reached out to a researcher a few days ago who connected me to a journal editor so I could get a copy of health disparities journals sent to my house. I was so excited! Finally, a chance to read about health disparities research from home. One interesting study I read last week concerned clinical trials, which revealed that minority patients were less likely to enroll in trials than white counterparts. I remember doing a workshop at a medical center and hearing a researcher lament about this phenomenon. It was great to have data on this disparity which i can share during workshops. As I was connecting with a few peer leaders, they told me that they loved to read my blog. I was so surprised to hear that. They told me that they checked my site and twitter every day to get to read it. They were also kind enough to give me some constructive criticism. They loved it when I used creative titles (like the ones I’m using on this post) and wanted me to keep doing it. They also wanted me to keep the blogs funny as they liked showing their friends and family what I was writing about. i was so ecstatic to hear that my blogs were making a difference, and it certainly gave me a boost to keep me writing. Today, I had the pleasure of having a call with one of our new team members that I spoke about in the last post. As we begin to recruit students to hold broader roles in the non-profit, I thought it would be a good idea to hear from the team themselves how they saw their roles expand and evolve as the year moves forward. One of the things this student told me was how he wanted more facetime with the leadership team. it was important for him to get to share his idea with us and hear feedback from his workshop. I was ecstatic to hear that he was so committed to the mission of the non-profit, and promised him regular meetings with leadership. Felt like a great day! The last blog post prompted some re-evaluation. Yesterday, I sat and read the words I wrote for a few minutes and thought of some next steps. I connected with the board and came up with an action plan for the next few weeks. Expansion is the name of the game, folks. We will expand like never before. I plan on bringing in more members to the non-profit so that we can be more succesful and more self-sufficient. Enough is enough with waiting around for change. Now is the time for action! There are some moments in our lives where tenets that we hold dear become completely upended. Today, casually, I had one of those. I had an interview for some financial support for the non-profit, and something that one of the interviewers said really stuck with me. Let your eye off the ball. I heard that and I was shocked. Why were we discussing baseball in this meeting? Upon a few seconds of reflection, the message hit me. Step back. One of my guiding principles with running this non-profit has been the idea of myself as a leader. Every email i send, phone call I make, workshop I run, I push myself to lead. Was it time to step back? Was it time to let the non-profit grow on its own? I asked these questions to the interviewer, but received just this reply. It’s up to you. Every frequent visitor of this blog knows that I write a lot about getting things done. The non-profit grind. I have come here today, hat in hand, to include an addendum to this idea. Continuity. You can be the hardest working guy on the planet, but if you move your attention from one project to another, all your directed energy and motivation disappears. it’s like you forget how to work on a project anymore. This is happening to me right now. For the last few weeks I’ve put my focus on other personal projects, and today I sat down to take a call from someone in Health Disparity, and I nearly forgot the URL to the website. It’ll take some getting used to as I settle back in to my lead role in this non-profit. Wow. Just wow. I just finished my first session with the students at the University of Maryland, Baltimore CURE Scholars. They were the most creative and thoughtful kids I have ever met. They wanted to do something about health disparities, so asked me to teach them about the issue and help them make a video. I filmed my story for the CURE Program a few months ago, and the kids loved it! The assistant Director called me up in fact to say how much she loved it. Anyway, now I’m teaching a module for the Program. The students wanted to create a video to show their families. Using their medical knowledge, they seek to create a “positive virus” with this video; they want to spread it across the internet, and have it take hold like a virus. I’m so honored to get to work with these folks. Today was the date of my USABO test, which I’ve been putting aside non-profit work for the last few months to study for. So needless to say, going in I was pretty nervous! However, now I have a backlog of non-profit related stuff to do. Like, we just submitted our 501(c)3 application! Wow, what a breath of fresh air! And I received our check in the mail from Peacefirst. This check will go towards the 501(c)3 application fee, among other things. Anyway though, these emails and phone calls I have to do are pretty scary. Back to work!! I’ve had to send out a few emails lately, in between the studying I’ve had to do (see Post 67). This summer, we have several medical internships in which we are teaching modules. The various connections we had there needed to touch base. February is around the time that summer preparations need to happen, So I’ve been had to organize a schedule for a time months in the future. I have to say though, creating a curriculum is pretty darn hard. I don’t know how teachers do it! I mean I have to speak to so many experts and professionals to decide what will be beneficial for students. Stay posted for updates. 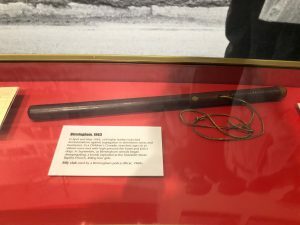 Post 68: Execution + Big NEWS!!!! Once in a while, all non-profit leaders get perspective on their initiatives. We must necessarily be overextended and involved many projects at once. For this reason, it’s easy for things to fall in the cracks. If you go on any forum for young leaders, you’ll see the term “execution” bolded. Execution is an incredibly important quality for a non-profit leader. Letting a project go is more than just a waste of time and energy, it lets down your collaborator. The secret to success is in execution. As they say, a bird in the hand is worth 2 in the bush; a completed project is worth 2 uncompleted ones. Also, something interesting. There is this organization called Peacefirst who encourage young leaders to change their communities. Well, I put up information about Health Disparity on their blog. A few days ago, I found out, we were selected for a grant award! That’s right, Peacefirst thought our project was deserving of some financial support. I’m so excited!!!! “During the past 10 years, cancer death rates in men” declined by approximately “2 percent per year, but they remained steady in women.” Additionally, the investigators “found a persistent gap between cancer death rates between whites and blacks.” The data indicated “in 2015, the cancer death rate was 14 percent higher in black people than in white people.” Although death rates are declining for all people but the difference between Black and White people remains steady. More work needs to be done to bridge this difference. Just finished Columbia Model Congress. I had a great time debating and being with my school friends. January turns out to be a busy month. Studies are going in Max mode. This weekend was the much-awaited Model Congress tournament at Columbia University. HM had a large contingent of almost 20 students. I had a great time. I got to speak a few times in the full committee. I integrated my experiences in health disparity research and on-the-ground interactions with minority community members in my speeches. I was able to use that forum to increase awareness about health disparities in other students. I got the Best Speaker Award in full committee. I am happy that my efforts were rewarded and I bagged a medal for HM. It was nice to get an email from the Peacemakers that I was chosen to receive a mini grant of $200 for my work with non-profit, health disparity. They are a non-profit organization which help young people around the world who are trying to make society a better place. They invest in new ideas by mentoring, advising and connecting with similar minded people. This grant will help me organize forums in schools with minority students and invite speakers to discuss disparities in health in poor communities. Go Peace First! You have given me an awesome opportunity! I am happy to see that the school newspaper has decided to cover our event. Everybody has a very positive recollection of the program. It is a good way to bring the message to rest of the students, faculty and the parents who were not able to attend the event. This is the first time that students and faculty in the school has been exposed to the concept of health disparities. The club members have decided to propose formalizing it in the school curriculum across the board. This will build on the conversation that we have started…and continue in the future. Post 62: Thank You Notes! I love my school! When our club proposed holding seminar on Health Disparities, school gave us full support to show what we’ve got. 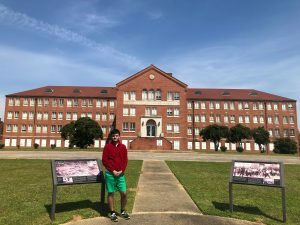 The teachers promised to bring their classes, the administrators supported us in sending formal invitations, the social service council granted credit to students attending the event. Our faculty advisor got his department to wait at the gate to bring the speakers to the venue. After the event, I wrote thank you notes, from my heart, to everyone that supported us and of course to the speakers. 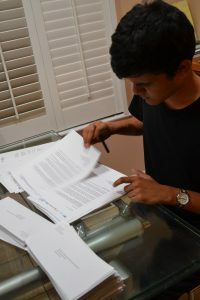 I am so happy everyone wrote back, with so much encouragement. I am blessed to be surrounded by such supportive people in my life. The Symposium was successful. The invited guests Dr. Sweeny from SUNY Downstate, represented AMA and the councilwoman of 16th Congressional District, Vanessa Gibson spoke passionately. The middle school and high school students filled the auditorium. People came with skepticism, not knowing what to expect from ‘health disparities’- a topic much foreign to them. But everyone soon got hooked as the speakers described scenarios that play out every day in our society: chest pain in a black woman is brushed off as anxiety and in a white male is worked up for heart attack! It was exciting to see so many hands raised, many questions answered, and many more left to be mulled on. The seniors from English class were assigned to write a paper on the seminar. 90 min is a short time to discuss this important topic…but for now…it was a good start. The Symposium is almost here. The formal invitations have been sent out. One of the speakers, Diane Nathaniel just informed me that she will not be able to make it. She was expecting a state inspector visit on January 17th. She is a very engaging speaker, and her story about her colon cancer survival really grips everyone. It is a great story of courage and how she has committed her rest of the life to saving lives of numerous other people in her community from colon cancer is inspiring. Hopefully we can have her come next time. I’ve recently come to realize that the most important time for successful execution of an event is its last 72 hours. All of the questions, concerns and loose ends are quickly raised in this time period. No matter how ready you are 2 or 3 weeks in advance, the last 72 hours will determine the outcome of the event. I’m experiencing this right now with the Health Disparities Symposium i am hosting with my club at my school’s Unity Week. In the past few hours, I’ve been back and forth on email and call with faculty, students, club members and presenters to finalize the schedule, It’s exhausting work! I’ve wanted to host a few more events in the coming weeks and months, but I’ve been in a bind. My goal is to collect enough responses for my IRB approved survey to be complete and data to be analyzed. However, I’ve found myself in a time crunch. During the time where I would be heading into Brooklyn and Queens for workshops, I’m doing Varsity Indoor Track in school. Don’t get me wrong, I love my sport, but i never considered its impact on the nonprofit. I’ve begun to feel a little bit anxious if the survey will ever be completed, or if it will simply fall to the wayside as more important things take my attention. The real damage to my event outreach has been the reduction in time that I could be calling and connecting with my city partners to arrange workshops. For the past few days, students and adults alike have begun to file into work. Not me, I have office until next monday. However, I’ve been receiving a barrage of emails and documents from those in my network. They have all just gotten around to reviewing what I’ve sent them, and they have feedback. For example, with the University of Maryland Baltimore collaboration I am working on, the project manager sent feedback on students’ projects and the curriculum. They also sent me a few additional contacts at their university who work in health disparities, which i will certainly follow up on in the next few days. The pace is breathtaking! I can honestly say I’m feeling pretty calm right now. I have finished all non-profit related stuff I planned for the break. Now, that’s not to say it’s all done, I will need a few of my collaborators to provide feedback on some of the work, but they don’t get back in their offices for a few days. You know what that means! Nothing, just nothing. No long-term planning for the non-profit (completed a few days ago). Nothing. So here I am, twiddling my fingers thinking of something to do. Offices, schools and municipal buildings are closed, but my mind is very much open! Go out of my comfort zone: I want the non-profit to do workshops in unorthodox places, in order to add those left out of the conversation. For example, I’m in talks with a school for the blind to do a modified workshop there. 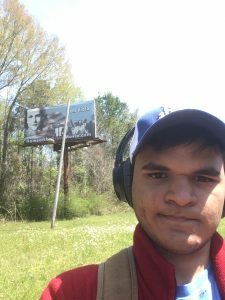 Disabled students need to talk about health disparities as much as any other, so I want to spend more time targeting areas like that. 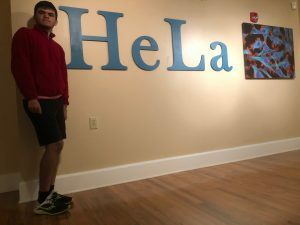 It’s not just the disabled, there are many groups that deserve more attention from the non-profit. I have a funny story to tell you. 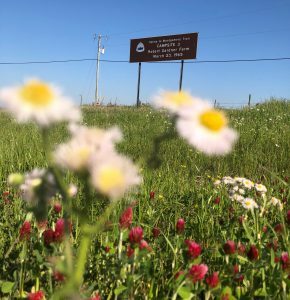 I was supposed to have a super-important call today with a collaborator that would dictate what the non-profit’s operations would look like next summer. I had a call scheduled that was supposed to take at least an hour. As I play around on my computer, waiting for the call to come through, I become gradually more agitated as I realize I never heard a ring, even though the scheduled time had arrived. I check my phone, and imagine my horror when I find out I missed the call! I immediately call back 2 or 3 times, to no avail. I become super depressed and check my phone to see what happened and how I missed the call. I immediately notice I have no signal and wifi calling was off… The person probably just went straight to voicemail! Such is the life of youth non-profits. Lesson learned! 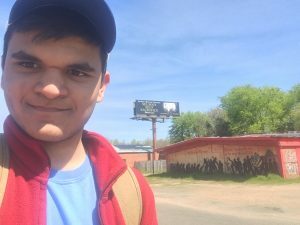 I wanted to spend some time explaining why I do research as a supplement to my work with Health Disparity. The way I see it, it’s important to have a scientific background in health disparities to lead workshops. Hen students ask questions, having accurate, informative and scientifically-sound answers is important. Further, many of my collaborators are in the healthcare profession. Therefore, they expect me to be able to converse easily with them in technical conversation. I also think it’s important for the attendees to see that students can pursue science at a young age. I’ve had kids come up to me and say they wanted to do public health research that I did, but didn’t think that they could start at a young age. By showing them that any age can do important scientific work, they should feel empowered to pursue it. Wow. You guys spoke loud and clear. I won’t be making any changes in the foreseeable future. 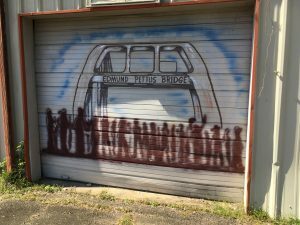 I received a bunch of responses from the many readers of this blog, both on twitter and on healthdisparity.org. I appreciate the feedback however, and encourage y’all to keep promoting and sharing my work! Hey guys. I’m writing to ask for some feedback on the website. I’ve been thinking about redoing it some. Maybe changing the theme and moving the blog to the homepage. Let me know what you think about that. The website was created mostly on a whim last summer as I was surfing website designs. However, as soon as I created it, I began to hunker down for hours on end tinkering and fine tuning it so that it would be pleasing for all visitors. I tried to add all the information about the non-profit as it is frequently visited by those I meet as I do public events. I also made it especially important to add lots of photos to make it engaging. Anyway, let me know what y’all think. The non-profit really enters a new light when you are overworked and stressed out over finals. I’ve somehow become more proud of how much I’ve accomplished with Health Disparity now as the weight of my finals burdens me. I think it has to do with workload. The incredibly workload that it takes to run Health Disparity is now crystal clear as I too have an incredibly high workload right now. I’m juggling Math and English, History too. It makes me dizzy just thinking about it. Anyway, just wanted to let you know about this phenomenon, the more work you have, the better your accomplishments look. School Club: Our 2 initiatives are going swimmingly. We have confirmed almost all of our presenters for our conference at the school on January 17th. We are also working on integrating health disparities into school curriculums, which is close to completion too. Finals have begun. This means I’ve hunkered down in my room, door closed, and the muffled sound of tears can be heard faintly coming from around the house. However, this does not mean the non-profit has ground to a halt. A few months ago, I would’ve said you were crazy if you had said that. I mean, where is the time to do any meaningful when there is already so much studying to do? However, I’ve managed to find a way. A few of my collaborators are working on a project (more details soon), and I’ve found it much easier to work on a larger project collaboratively than individually. Thus, I’ve been able to sneak in a few hours of working on this project during my finals week. Imagine my surprise when I open my inbox this morning and get an email from a kid who said he enjoyed my workshop. He found my business card and wrote me from that email. It’s so nice to hear from attendees, especially from kids, and see what they liked about our TALKS. He mentioned that his favorite part was the round table discussion at the end because he got to ask important questions that he had, but couldn’t get answered. Upon reading his name, I smiled because I remembered him and his contributions during the workshop. He was super excited to be there and was constantly smiling, raising his hand and answering questions. I’m so proud that at least 1 person got something out of our workshops. This is the intent of our survey questionnaires which we will be distributing shortly. Smiling on the inside! With Christmas rapidly approaching, I’ve begun to wonder what I’m going to do during Winter Break. The usual after-school club sessions that I’m invited to present at are out of session during this time. All of my collaborators across the country are on vacation or otherwise out of commission during this time. Therefore, I’m stuck at home. However, I’ve recently begun to consider that some quality time at home is exactly what the non-profit needs. Time to consider the next steps and new initiatives to swallow up my every waking (and sleeping) hour. Who knows what sort of peace of mind I may draw from this thinking vacation if I can chart my non-profit’s course for the next few years. I’ve previously written about my perspective on interacting with adults in a professional setting through the non-profit. I’ve said that running Health Disparity has taught me a lot about how to do this and develop professional relationships. However, I’ve recently come to a new point in my theory. These skills are like a muscle. Only when they are used frequently and exercised do they develop. However, if you do not talk to adults for extended periods of time, they begin to atrophy, and the advances you have made will disappear. This is especially distressing for me as I’ve seen my own skills begin to fall off as school has consumed my attention. Thus, when I do end up on a call every few weeks, I find myself forgetting to take notes, write followup emails or keep the conversation engaging. These skills only come with experience, so I hope to develop them more in the New Year when things settle down some. It may come as a surprise that, as a Generation Z high school student, I don’t use very much social media. Sure, I have a Facebook for class discussions and keeping track of my friends’ posts. Otherwise, though, I have little experience. For that reason, it’s been an eye-opening experience running my non-profit’s Twitter page. Many of the lessons I expect one would learn from running their own personal pages I’ve had to learn much later in the game. Things like a “ratio” of retweets to likes indicating the quality of posts, or a ratio of following to following indicating your reach to audiences. First of all, it seems funny that they are nearly all about ratios, and secondly I find many of them self-fulfilling truisms. If everyone believes that the more “following” you have on twitter, the more desperate you are for “followers”, then you will lose followers, perpetuating the cycle. In my opinion, I find social media to be a tool that is best used if one disabuses their presupposed notions and acts in good faith about one another’s intentions. Just got back from Yale Model Congress. I had a great time debating and being with my school friends. I’m super excited to write this post. We have just confirmed our first speaker for my Health Disparities club conference at my school. The distinguished speaker will be Bronx Councilwoman Vanessa Gibson. We look forward to her presentation on her work improving public safety in the minority district that she represents. Gun safety, incarceration and housing violations are all important facets of the health disparities equation, and so its incredibly important for students to hear from policy makers in their efforts to improve them. For the students at my school to hear from this incredible councilwoman, I’m sure they will be inspired and engaged. Looking forward to January for the workshop! Since my last post, I’ve begun to prepare for the Yale Model Congress Conference, which I’m obviously super pumped to attend. However, I’ve had some concern as to its impact on my schedule. As the Health Disparities Club at my school which I’ve founded has begun to organize our event for Unity Week, weekends have become precious resources. During weekends, I spend time hearing feedback from team members and advising them on their role in the club. For example, as we have begun to lock down speakers, the club members have been searching for more distinguished guests to invite to attend the workshop. However, my experience in working with the healthcare and non-profit community will not be able to be harnessed in this pursuit as I will be unavailable due to this conference, so the club members will be on their own. However, I have much confidence in their abilities to organize the event. I just wish I could help out more. As you’ve probably gleaned by now, ever since the academic year started, I haven’t had much time to connect with colleagues over the phone. If at all I’ve had to speak to them, I would write them late night emails. Recently though, the pressure has been building as what few calls I was able to take have dwindled. I’ve recently started running Varsity Indoor Track at my school, and therefore, where there used to exist a solid 6 hour hole in my schedule to take calls, there is now practice. Thus, as practice end at 6PM daily, much past regular office hours, I’m forced to take calls during 15 minute breaks in my school schedules. This system has obviously become unsustainable as slight shifts in academic requirements quickly fill up available time each day, forcing me to cancel or delay calls. It’s officially Thanksgiving break. That means time to hunker down and write emails! As I had previously written in one of my blog posts now is the time to followup with people. I’m also recording a video for the UMB CURE Scholars Program during this break and will be planning my non-profit’s moves for next summer. I don’t want to spoil anything, but there are quite a few exciting things in store! My non-profit’s initiative at my school has really taught me a lot. In the non-profit, I am usually leading my peers and younger students in the normal activities of health fairs and running internships. In the health disparities lecture series I am preparing at my school, I need input, advice and dedication from my school club members. This means I need to develop my experience as a team leader. It has certainly already given me new perspective in leadership of peers, which involves more than just bossing around. Although, I’m super excited and glad to be in this new leadership role because I love to work with my friends to build a project. In being a team leader, the most important quality is certainly open-mindedness, to new ideas and techniques both. Sometimes, club members will have ideas hat seem foolish at first, but upon closer consideration just what the project needed. I’m in a bit of a pickle. I am working on distributing my survey for adult populations to quantify the non-profit’s impact. I’ve already done this once, at a health fair I helped organize in Brooklyn, but other opportunities to distribute have not coalesced. Rather, I’m stuck at my computer thinking of forums that will accept my presentation and IRB approved survey. It’s a hard task, 99% of events have speaker lists already prepared, and so my requests will fall on deaf ears. For events that haven’t been finalized yet, I would need to know the organizers in order to know of their existence. Again, I’m stuck because I don’t know of any event organizers in New York City. So then, there’s not much I can do. Today, I had a few important phone calls to take. I ended up spending time during the school day during free periods to take them. One of them had to happen after school during my Varsity Indoor Track practice. Funnily enough, I ended up taking the call as I walked back to the school from the park where practice usually happens. Out of breath, gasping, I had to have a professional conversation about the non-profit. In the background, cars and people talking and running were audible, but I had to push through. The call ended up going well, and it lead to a followup conversation planned for later in the week. 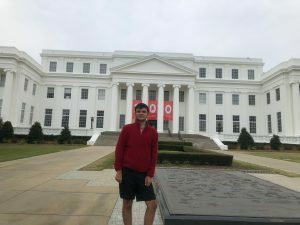 Of course, I apologized for the poor timing, but I found the experience could encapsulate well what it’s like to be a student that runs a non-profit, especially during trimester testing week. Just as I was jubilated with the approval of SUNY Downstate for our student IRB, I am again stressed. I have to go through another IRB process, equally as treacherous and laborious as the previous one through the New York City Department of Education. I already feel trepidation of embarking on this journey. A whole new application form, new questions and more revisions to the study along the way. Just goes to show that when you think you’re done, you’ve just begun. I recently learned that my non-profit’s IRB application for a survey and focus group targeting students has been approved! I’m absolutely giddy with excitement about what can come from this development and taking a look at the results of the study. I have already begun to reach out to a few potential forums for new TALKS and am working with my collaborators and teammates on how best to distribute and target our forums. All in all, though, I’m incredibly pleased with this development, and hope to soon begin publishing our results. 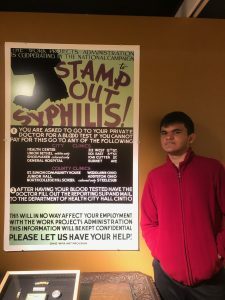 I’m especially delighted because of the extra effort it took to create avenues to obtain informed consent for students, which the non-profit has innovated with the help of healthcare professionals and public health workers. Whenever I see inspirational stories of other non-profit leaders or founder, I feel a twinge of guilt, envy and hopelessness. I am nearly always impressed by the issue they address, but envious of their success. I’m nearly always reminded that as a student, I will never be able to grow my non-profit as much as adult counterparts. 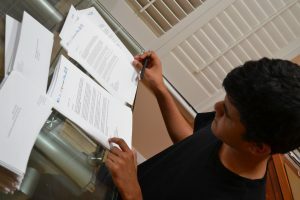 I list the variety of advantages that being a student non-profit founder has throughout this blog, but one most important factor opposing these claims is omitted, time. I never have enough time to delve deep in my projects and form meaningful connections with community members, and I am always regretful. Post 29: Am I doomed? As the year stretches on, I have begun to unfortunately make fewer and fewer connections with people. However, the crux of this post is with those that I have made, but have failed to develop on. After the first few cordial replies and expressions of interest, I’m unable to followup or provide the in-depth information requested as I get swamped with schoolwork/other obligations/sports and the list goes on, as I’m sure you’ll know if you ever attended high school. Further, long-term engagements, those that require followups/reminders months or years following initial engagement have begun to deteriorate for me. Being a full time student complicates these commitments. Could this mean that I’ve missed opportunities, let my potential partners down and most importantly, failed to spread awareness of health disparities to those who desperately needed the knowledge. Probably. I’m excited to share some positive news with y’all! One of my goals with Health Disparity recently has been to seek mentorship regarding the future direction of our non-profit and plan successful future projects. Further, I’ve also been looking to recruit new members to lead the non-profit beside me (it can get pretty lonely sometimes D: and access resources to provide the non-profit’s existing members with the resources they need. 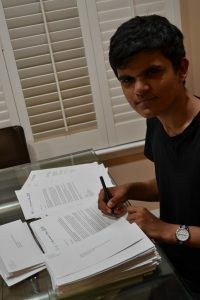 In this pursuit, I applied to the QØ startup incubator, which offers high schoolers with innovative ideas an opportunity to develop them further. Imagine my surprise when I heard that the program found promise in me and my Venture, and accepted me into their program! I am excited to pursue this opportunity further and develop this non-profit. I’ve begun to tabulate our survey results. Above is a preliminary data sheet with some of the survey results listed. Today, we held a TALKS at the St. Jacobi Church health fair in Brooklyn where our survey was administered for the first time. What a sense of excitement to see a document that has been pored over again and again finally be put into action. We received some wonderful responses from the attendees and I look forward to tabulating the results in the coming days to assess the impact of the non-profit and determine our next steps. The health fair was also a lot of fun, I got to speak to many audience members many of whom had never heard of health disparities or the work that our organization does before. The attendees were eager to hear me go up on stage, so I hope they enjoyed my presentation and learned a lot from it. As this health fair was focused on the Hispanic community, my presentation focused on stats and suggestions for this population. I’ve been hard at work recently. I was invited by the UMB CURE Scholars program to teach a module on health disparities for middle school students for the academic year. I’m incredibly excited to embark on this opportunity, not only because I can expand my work at New York Presbyterian Lang Youth Medical Program for many more students, but also as it expands the reach of the non-profit into another region which suffers from adverse health outcomes. For example, Baltimore was one of the few cities nationally where Black male cancer mortality increased from 2008-2012 while all other races saw a precipitous drop in mortality, indicating a stark health disparity. Even though our curriculum is still being hashed out, this will absolutely be an amazing opportunity for all parties involved, and I look forward to when the programs starts. It’s never easy to get rejected in person. It’s even worse when it’s over the internet; but the worst is when rejection comes in the form of disappearance, when your emails don’t get replied to and your calls don’t get answered. For a non-profit founder, and especially as a youth, having adults who seem excited at first to work with you and hear your story fade away. The giddiness that I felt first talking to them and imagining opportunities for our partnership goes away too, and I feel stranded. These days, I feel like I get this feeling more than ever as often times the best people, the people who I think, “I can’t believe I’m talking to his person” refuse to followup with me. The HDisparity twitter page has been expanding lately. Emory and Northwell Medical Centers recently followed our page, among other community members. I usually post at least weekly on the page, and have received positive reception on nearly all of the posts. We have tens of thousands of impressions, with active engagement from our group of followers. In addition, we receive messages from followers who enjoy following our page and wanted to give feedback. Recently, my study for surveying adults following health disparities workshops has been approved by the SUNY Downstate IRB. I am ecstatic. Not only because this is finally my chance to show the impact of these workshops to my scientific peers, but also because I hope that our success will lead to a new model of health disparities education; a model that relies on individual inspiration and action to improve communities rather than our traditional top-down model. After many hours of grueling labor to plan out and organize the study, I’m excited to finally have the chance to carry it out and see the results. Recently, I’ve updated my website to add some new programs that the non-profit is engaged in. While I don’t have a web design background, I found the experience to be enjoyable and interesting. I have not found many outlets for my passion for graphic design, so having the opportunity to create an art piece of my own, displayed on the computers of thousands of people all across the world, has been an incredible experience for me. I search more frequently for web design tutorials and graphic design guides to make my website appealing for all visitors. I’m proud that my passion for health disparities activism has in fact bred a new interest and outlet for me that I would not otherwise have had. I’ll be posting on twitter soon with a few highlights of this updated site. Recently, I was invited to attend a panel discussion in Brooklyn where medical professionals that investigate health disparities spoke with cancer survivors to a diverse crowd. 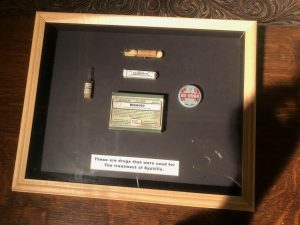 I was thoroughly awed by the experience, and saw this as an interesting idea I hope to see more of. Seeing cancer survivors explain their stories, from first symptoms to remission, while medical professionals commented on their condition and explaining the pathological basis to the disease to the audience was incredibly interesting. The advice the healthcare professionals gave for those who are looking for treatment was also an incredibly valuable insight, as they recommended clinics in the area staffed by healthcare professionals with many years of experience in diagnosing community members who do not get regular checkups from a General Practitioner. Another incredible insight was hearing in retrospective the mistakes that people make after receiving their diagnosis, and advice to audience members on how to avoid the most common ones. Overall, a wholesome experience! Currently I’m embroiled in intense planning as I fill out an Institutional Review Board Application for my non-profit healthdisparity.org. My collaborators at SUNY Downstate have been gracious enough to lend support in the IRB application process in guiding me in writing and review changes. They have also helped me design what will be one of my first independent study, a groundbreaking investigation in a new method of community activism: student led workshops. I hope this study will reveal what I have known to be true since the founding of this non-profit, that students can be inspired by other students who have embraced topics they are passionate about and make a positive impact in their community. 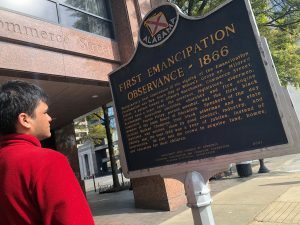 In addition, a focus group for students of color is planned to gauge their reaction to the workshop, and a survey for adults is also in the works to see the impact of student led workshops on adults. One exciting new endeavor I am embarking on soon is an advocacy group for health disparities at my school. The club held a booth during the clubs fair a few weeks ago, and we received some great turnout and large recruitment. Hopefully, my fellow club members be able to organize a symposium during the Unity Week at my school. We plan to have speakers from across the New York City area visit the school and speak to the student body on important issues concerning health disparities and diversity. There are some leading thought leaders that I’ve met throughout my work at Health Disparity that I would love to invite to the school. They would be able to share wonderful knowledge with my fellow classmates. Recently, I’ve been inundated with emails. When you help organize health fairs and connect with large organizations and non-profits, email writing can be a full time job. One of the most difficult aspects is remembering who you have to write to. A professional handing you his card and recommending you reach out can be easily forgotten, a missed connection that could have lead to exciting opportunities. I try and organize my business cards by event for that reason, so I remember who needs to be replied to and from which event I should reference meeting them. For the body of the email, it can take up to 2-3 hours writing personalized emails to all of the people I meet at an event. All this work, of course, with the expectation that I would be lucky with a 5% response rate. I’m looking forward to an exciting panel discussion I have been invited to speak at with my hero Ms. C Diane Nathaniel. A stage 3 colon cancer survivor and founder of the 501(c)3 non-profit Beat Stage 3. She has been an incredible inspiration for me as she advocates for cancer survivors and encourages screenings to community members. She has helped guide me in my impact on communities of color, as she is a minority herself and thus knows how to connect with them on a personal level. Through her mentorship, I have been able to achieve wonderful things. Recently she invited me to speak at a panel discussion at a church in Brooklyn, at a community event organized by a sorority. I will be beside healthcare professionals, community leaders and cancer survivors. I’m so excited to take part, and cannot wait for the event! October has just begun, which means school has immersed myself and my peers. I thought today I would give some insight into how this blog is run. I try and keep a schedule of 2-3 days per post, in order to keep all information up to date and accurate while also accommodating as much information as possible. I usually sit down in front of my computer, and begin to write. Sometimes, the idea of a post comes to me, like inspiration from the gods. Most times however, I wallow in writers block, and have to push myself to think of creative, interesting and insightful articles to post. When I do come up with an idea though, I hammer away at the key board. The words come to me and I just keep going and going where the thought leads me. Just like this. Sometimes, I just can’t stop myself from writing nearly 2 paragraphs of text. Afterwards, I edit and trim my writing to make it presentable to my audience. First of all: It’s been just over a month since my first blog post, and I’m so excited. What begun as an experiment to gauge interest has really grown into an honest and thought-provoking blog. I’m proud to have made it this far, cheers to another month! Anyway, today marks another health fair on my jam packed calendar. Today I went to a fair at a church in the South Bronx that I helped to organize by reaching out to 100 schools to attend throughout the Bronx. It was an interesting experience, lots of colorful booths and free flyers and treats around. Pfizer and the Latin-American Consulates had significant presences in their efforts to reach out to the Hispanic community. My presentation followed a touching one delivered by the Alzheimers Association. I had brought multiple props, posters and presentations, but the space couldn’t accommodate them so I was left to speak to a crowded room of adults with only a microphone in hand. And I did. For 10 minutes. I passionately broke down the topic at hand. I sweat profusely. and stumbled a little bit, but I’m happy that for the most part it was delivered clearly enough for the audience to understand, as demonstrated by the burst of applause after my lecture. I met with a variety of important organizers at the fair, and can’t wait to attend the next health fair that I helped organize in Passaic, New Jersey. Today, we presented at the CISCRP AWARE for All in Newark, New Jersey in Rutgers. It was an incredibly enjoyable experience. I got exposed to clinical trials and the Institutional Review Board Process, which I am going through right now as I work on a study on our impacts. I was also fascinated by all of the information on clinical trials and its relationship to health disparitiesI was introduced to. It turns out that not only is low participation from minority patients a leading cause for health disparities, but new efforts to encourage and increase this participation can pay massive dividends in the future. Something to look into! They say the best plans are cooked up last minute. That idiom has played out especially well for Health Disparity over the past few days. We have received invitations to a few prestigious events and health fairs in the coming days and weeks, seemingly short notice for others but welcome for us. I am most proud to be invited to a community symposium in Newark in a few days, which will feature some distinguished medical professionals encouraging participation in clinical trials for minority community members in the area. This is a brave first step for the non-profit in exploring the impact that low clinical trial participation has on health disparities, and I will be on the lookout for ways to integrate what I learn there into my presentations. I had a phone call the other day with someone who I deeply respected as a leader in health disparities activism in the tri-state area. When I spoke on the phone however, a high school student and a professional with decades of policy experience under his belt, I was incredibly nervous. A phone is a democratizing device, speaking face to face establishes clear dominance hierarchies in terms of height, strength and age. Over the phone, however, only voices can be heard, equating both parties. I was scared of sounding too aggressive or disrespectful, a mistake easily committed using this device, and I wish I could have told him how much I respected him and his work and how my numerous questions were out of curiosity rather than malice. For a youth to speak face to face with an adult is one difficult experience, but for a youth to speak over the phone with one is an entirely different animal. A break. One of the few which are afforded to me. It’s refreshing, in a way. Time to step back, reflect on the breakneck pace of school work and the new ventures that Health Disparity will soon embark on. I’m jittery, in just under 1 month, we have 5 important opportunities to prove our model for health disparities activism. But, the spirit of the holiday is a reflection: on a year that has passed and a new year that has yet to begin, I’m excited thinking about what this new year, 5778, will be filled with. Could it be more grassroots health disparity activism by students, an accomplishment which has been gaining steam for months. Could it be a breakthrough in health disparity research which I am conducting. A bright future waits, and I hope to catch it. As school ratchets into gear, the crunch on our progress is audible. It’s hard to return calls and followup on emails when tests and quizzes loom. For that reason, a different strategy is required. One which does not rely on raw man-hours, but rather effectively and efficiently divides work into its constituent parts, allowing for more flexibility with my limited hours of light. The question always arises, how does one maintain the breakneck growth of the carefree days of summer into the arduous school years. Through this new method, i believe the charity can hack it through these wild 9 months. I’ve never really thought of myself as an entrepreneur. Sure, I have innovated a new model for health disparities awareness and identified an audience that has rarely been engaged in conversations around health, students. However, I feel like entrepreneurs inherently try to take advantage of situations for their or their firm’s benefit. I see the reverse as true for Health Disparity, where there is an inequality, we seek to fill it in and guide community members how to work in the future to maintain equity. For that reason, I find “non-profit entrepreneurism”, a term often flung around online and on social media to be an oxymoron and a misguided term. Instead, I would refer to myself simply as a “social innovator”. 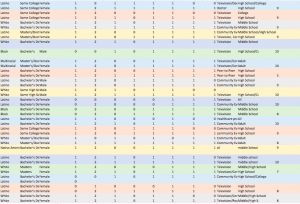 I have spent the past few days using Excel spreadsheets to invite schools to Health Disparity workshops. It’s tough work, and sometimes tedious, what with all the copy-pasting, double checking and documents crashing. It’s also sort of thrilling though. I mean, it’s not often that a student will engage with a school that he has never set foot in. I wish I could describe more vividly how the students benefit from these workshops. The same unfortunate lack of awareness of student health needs that plagues the student body oftentimes can afflict whole communities, one of most potent risk factors for health disparities. For that reason, it is often difficult to engage certain populations with the topic of health. 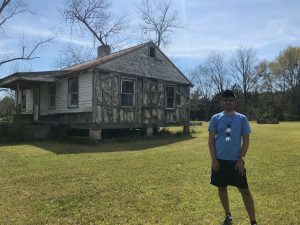 However, when health disparities awareness does spread to vulnerable communities, it is often an amazing and inspiration experience for both volunteer and community member. Crossing my finger for a good turnout! Now’s the time of year where fall and winter health fairs begin to take shape. Buildings get booked, schools get notified and speakers get chosen. I am proud to be presenting at a few in the tri-state area, and am excited to meet new people and have real input into organizing a health fair, an opportunity my non-profit has not been afforded as of yet. Although, it’s stressful work reviewing my presentations and updating them all for accuracy and new findings. I’m so excited to again get my feet on the ground and speak to students of diverse ethnicities and backgrounds once more, a pleasure that I treasure every moment of. Paperwork is tough. That’s why as I begin to apply for my not-for-profit’s 501(c)3 status, I am apprehensive. Between long pdfs covered in legalese to long term planning about the financial future of my non-profit, I feel exhausted. The other feeling I have, sneaking up in the back of my mind, is anxiety. What if the IRS rejects my application for tax-exempt status? What would I do then? How would I continue to grow Health Disparity, apply for grants and connect with fellow community leaders without the “501(c)3” badge? I try and keep these thoughts cooped up deep down in my brain, near to hippocampus probably, and focus on the present and positive. Maybe a bright future and success awaits this endeavor of mine, and a submitted application can turn the key. Whatever the future holds, just know it took a lot of red tape to get there. It’s never easy to budget time to enjoy yourself when you’re always on the clock. For a non-profit founder, there are always opportunities to explore, people to meet and emails to write. Every dull moment seems like a knife piercing your abdomen, and every delayed commute or missed meeting, a twist of that knife. The ever ticking clock has and will forever continue taunting every human being with reminders that their time is limited, but for someone who wants to give back, like myself, the words seem more painful. The thought that the health disparities crisis will not be solved in my lifetime seems to me both a chilling thought and an eventuality. Even more disturbing yet is the feeling that I could have stopped it, had I done XYZ rather than ABC. However, there is a sort of perverse pleasure in that idea. That maybe putting a chink into health disparities is a victory in and of itself. Maybe no one will ever be able to stop it, but maybe I was a little bit closer. 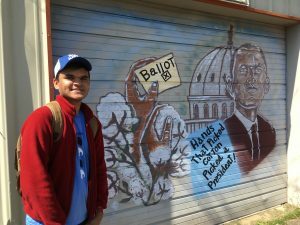 For a student-run non-profit, the academic year can be difficult. Exciting new ideas and intriguing opportunities with community leaders nationally have to be nixed, at least until Thanksgiving. After a season of 9 hours naps and frequent outings, certainly no student wants to return to school. However, for myself, entering the 10th grade is a bittersweet moment. At once, the previously mentioned growth of my non-profit will grind to a halt while I grow personally as I reunite with friends, join clubs and enter challenging but intellectually stimulating classes. I suppose that I have no real choice in the matter, time will continue to march on, leaving all the rest of us in the lurch. Welcome! This is the start of an exciting new experiment, I want to write a new blog post every few days describing what it’s like to start your own non-profit without any of the rose-colored glasses or nostalgic descriptions that come in “origin stories”. I’m sure everyone knows about how Apple started in a garage, and was built with hard work and dedication into a multi-billion dollar company, but I’m sure that success came with the benign stories and struggles that oftentimes define the fate of any endeavor. I want to try capture a real “origin story” with all the worts, laughs over misspelled emails, concern over unanswered emails and stacks of business cards cluttering a room, you know, the things that never make it into the movie. So, without further ado, welcome to our new blog!